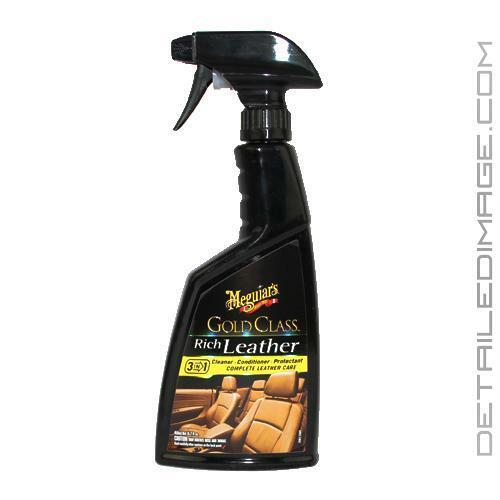 Meguiars Gold Class Rich Leather Cleaner and Conditioner provides a simple, highly effective, one step solution that cleans, conditions, and protects leather without leaving behind a residue or artificial gloss. Simply use a clean microfiber applicator pad or towel and wipe a small amount of this product onto your leather. Rub it in, let it dwell, then buff with a soft, clean microfiber towel. The gentle cleaners will lift away dirt and oils that can discolor the leather, without over-drying it. The natural aloe in the conditioner will nourish your leather leaving it with a supple, soft feel once you are finished. Apply the Gold Class Rich Leather Cleaner and Conditioner regularly to maintain healthy leather surfaces and to protect them from harmful UV rays. Pick up the Meguiar's Gold Class Rich Leather Cleaner and Conditioner today and cleaning and condition your leather in one easy step! Premium conditioners and aloe nourish leather for a supple feel & look. Meguiar's Gold Class collection blends the finest conditioners & premium ingredients. Try any of our other Gold Class products to deliver exceptional results. DIRECTIONS: SHAKE WELL. For best results, apply to a clean and cool surface. Test for colorfastness and compatibility on a small, inconspicuous area. Spray directly onto leather surface or spray onto a soft, clean 100% cotton terry cloth towel or microfiber and work into leather surface. Keep turning the towel or microfiber to a clean portion for best results. NOTE: Not for use on suede. Does not contain lanolin. Store and transport in a secure upright position. Also excellent for use on leather briefcases, luggage, furniture and handbags. Works as advertised. I've used it for several years, and there have been no problems. It leaves a very subtle sheen on my black leather seats, but I like it. For the price this is an excellent product for leather seats. I use it weekly for a fast one step clean and conditioning on my convertible seats, which quickly get dirty with the top down all summer. It also has an UV protectant so I don't worry about my leather baking in the sun as much. It smells good too. As always, quick excellent caring customer support! Why I always order from you guys!!! Thanks again!